Much of the fascination of this country lies in its myriad historical sites, the obelisks and stele of Axum, the churches and coptic monasteries in the Tigre, in the Lake Tana isles and in the Lalibela: the African Jerusalem with its monolithic churches. 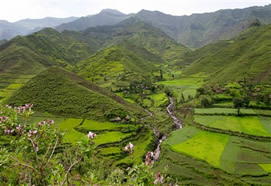 In Ethiopia there are also nine national parks, two of which include the mountain groups of the Simien and the Bale, while the others lie in the Rift Valley towards Kenya. The unforeseeable wild landscapes are surely the main attraction of these parks, where many of the animal species are protected, and some of them are endemic to the area. The proximity of Ethiopia to the Equator and the variety of its habitats make it one of the richest countries in Africa in wild bird life. History and nature are not the only attractions of this surprising country. It is a unique experience to come into contact with its people, so deeply rooted in their traditional culture, to participate in religious rites in one of the many Coptic churches, to meet native populations like the Hamer, the Mursi, the Caro and the many others whose lifestyle is hard to imagine today, so far is it from our modern life. Ethiopia (Abyssinia) is located in the east of Africa, commonly known as the Horn of Africa. It covers an area of 1,1 12,000kmq, twice the territory of France, and has an estimated population of 58,000,000 inhabitants with 80 ethnic groups. It is bounded on the northeast by Eritrea and Djibouti , on the east and southeast by Somalia, on the south by Kenya and on the west by Sudan. 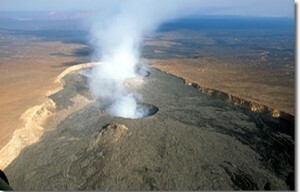 The Ethiopian landscape is dominated by a volcanic plateau with an average altitude of 2000 meters, which decreases towards the country’s borders on three sides. The Rift Valley begins at the Red Sea and traverses the Danakil desert (which contains the lowest point on the earth) continuing towards the south of Ethiopia and Mozambique. It is almost certain that human beings and their hominid ancestors evolved in the eastern zone of the Rift Valley: Lucy, our most distant ancestor, who lived 3.5 million years ago, was found in the Awash Valley. Ethiopia has a very strong cultural identity, which has been preserved thanks to a long period of independence, lasting practically until present times. According to legend the first Ethiopian king, Menelik, was the son of the biblical king Solomon and the queen of Sheba. According to history, the Ethiopian empire originates with the pre-Christian reign of Axum, which lasted until the 10th century. And it was in Axum that the Ethiopian Orthodox Church was founded in the 4th century A.D. It is the oldest Christian Church in Africa. Ethiopia has two main seasons, the dry season which lasts from mid-September to the end of May, and the rainy season which goes from June to September, with an average temperature of 25° C.The best time to visit Ethiopia is from September to may. Amharic is the official language of Ethiopia, and English is widely spoken. Ethiopia has a calendar of 13 months: it follows the Julian calendar which is divided into 12 months of 30 days each and a 13th month of five or six days at the end of the year. The time difference is +3 hours from Greenwich.